HOME OF ‘BATTLE BORN NEVADA TRIVIA’ – THE MOST ENTERTAINING BOOK ABOUT THE STATE OF NEVADA EVER WRITTEN! 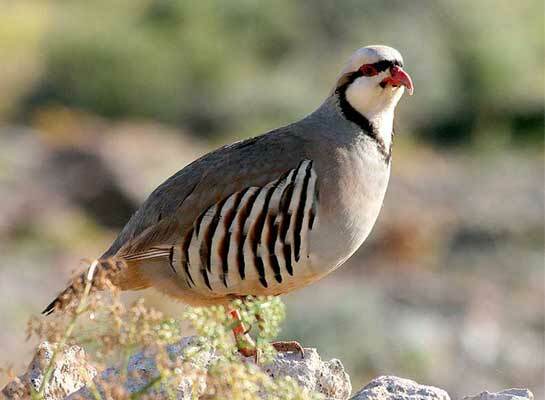 The Chukar is a medium-sized bird. It is a pale-colored, but boldly patterned bird. The bird’s red bill and legs contrast with its pale gray upperparts. A black line surrounds the bird’s whitish throat and cheek, and extends over its eyes. The Chukar’s sides are cream with bold black stripes. Pale orange under-tail coverts and red outer feathers adorn its short gray tail. 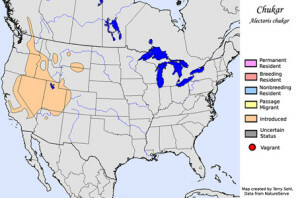 In 1947, Nevada sportsmen were introduced to the Chukar partridge, a rough-and-tumble upland game bird that originated in the rugged uplands of the Middle East. “Chukar are the most popular game bird in Nevada and folks always seem to have questions about the history of the species in Nevada and want to know more about their habits, food preferences, habitat and distribution across the state. One of the reasons the Chukar is so popular with sportsman is that they taste good. Chukar hunters love to trade their favorite recipes with their friends. 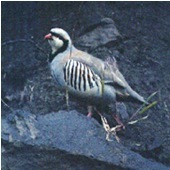 Chukars can be found on steep, dry, rocky slopes with shrub-steppe vegetation. Cheatgrass has long been regarded as an important chukar food source, but there are miles of cheatgrass canyons in northern Nevada and I’ve found that the other key habitat ingredients–rimrocks and sagebrush–are just as important in winter. Rimrock outcrops are great places for chukars to roost and seek shelter during bouts of nasty weather. Sagebrush may be the most under-appreciated element of winter chukar habitat. I’ve flushed countless coveys in chest-high sagebrush, often on little benches or where two draws came together. Sagebrush pockets provide protection from the wind and shade during warm winter days. Often found in small groups, especially in the winter, Chukars feed primarily on the ground, but will climb into shrubs or trees for berries. Chukars feed primarily on seeds, cheatgrass, and thistles, switching to insects and green leaves in the summer. To make the nest, the female creates a depression in the ground and lines it with grass, twigs, and feathers. The nest is typically hidden under a shrub or rock. Clutches are large, with 8-14 eggs that the female incubates. Female Chukars sometimes lay a second clutch of eggs that the male will incubate while she continues to incubate the first. Shortly after hatching, the young leave the nest to find their own food, although one or both parents will continue to tend them for some time. Besides being an authority on the Nevada state flag, Martin is the creator of 'The Nevada Trivia Game', author of 'The Nevada Outhouse Trivia Book' and longtime owner of 'The Flag Store Sign & Banner' in Sparks, Nevada.